Although consumer confidence around the world has lessened over global economic concerns, consumer staples stocks have historically provided downside protection amid volatile markets. If you look at the year-to-date, the Consumer Discretionary SPDR ETF (XLY) is up 5% while the S&P 500 is sitting on a 5% loss. As a group, consumer stocks moved lower this week, with the XLY losing as much as 2% before cutting its loss to 5 basis points (against the broader market’s 50 basis point loss). And the select names in this group held strong and are looking like great bullish plays on their technical merits. From its nightly scan of 65,000 trading instruments, the Profit Scanner powered by Recognia has identified four such consumer stocks with bullish charts. 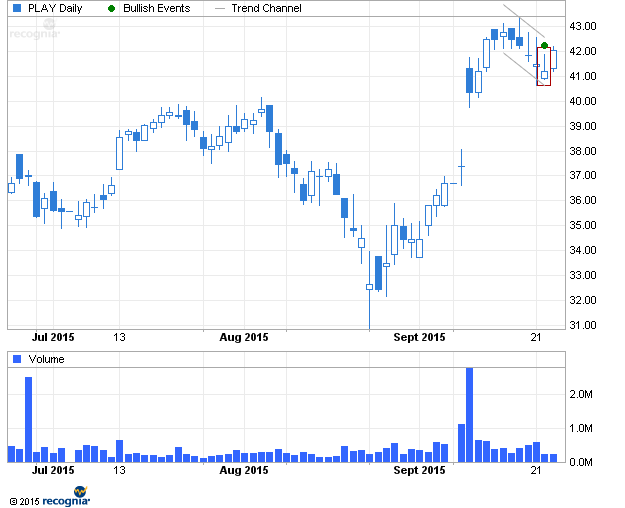 On Monday, Walmart (WMT) flashed a signal that has come up a lot in these volatile times — the bullish inside bar. Basically, this pattern tells us that bulls are beginning to take over after a long stretch in which bears had the upper hand. The inside bar develops during a prolonged downtrend, and its trading range is completely within the boundaries of the prior bar — hence the name. This suggests that bears are losing power and the balance between buyers and sellers is evening out. There’s no specific price target with the inside bar. However, expect the potential upside to come quickly, as the inbound trend took just five days. Tuesday Morning (TUES) is looking short-term bullish as well. In this case, the signal came on Tuesday (fittingly), and took the form of the hammer. The hammer consists of a bar with a small real body on top of a long lower shadow. It emerges in a downtrend, at the top of the recent range, as the stock recovers high from a sharp decline earlier in the session. 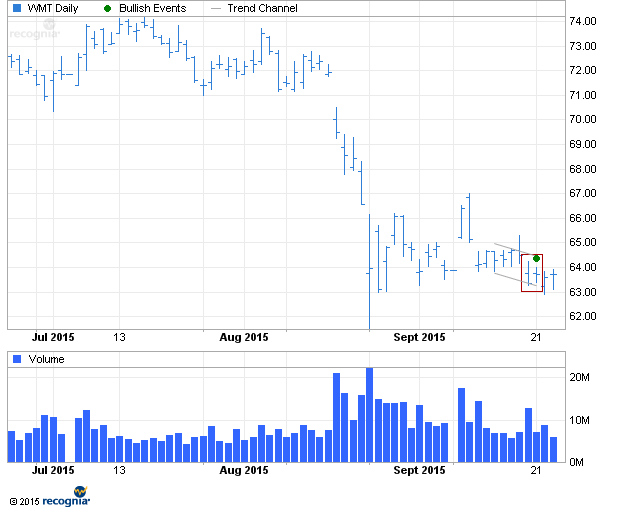 This suggests that the stock may have bottomed and is due for an upside reversal. 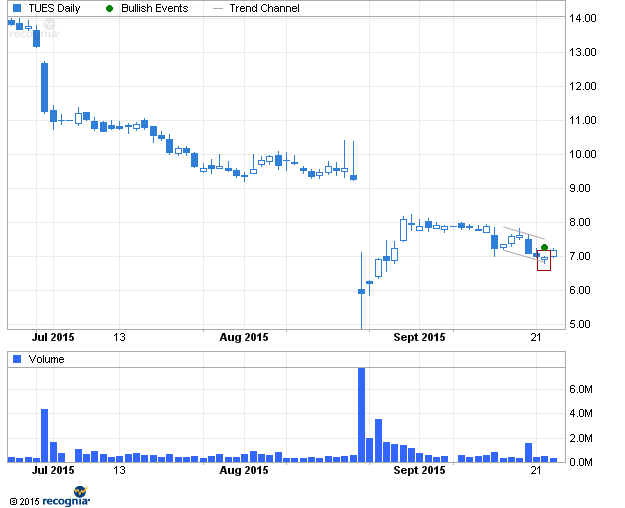 Zoe’s Kitchen (ZOES), the Mediterranean fast-casual chain, put in several bullish signals on Monday and Tuesday. First was the bottom triangle, a sign that the stock is due to reverse higher in the intermediate term. 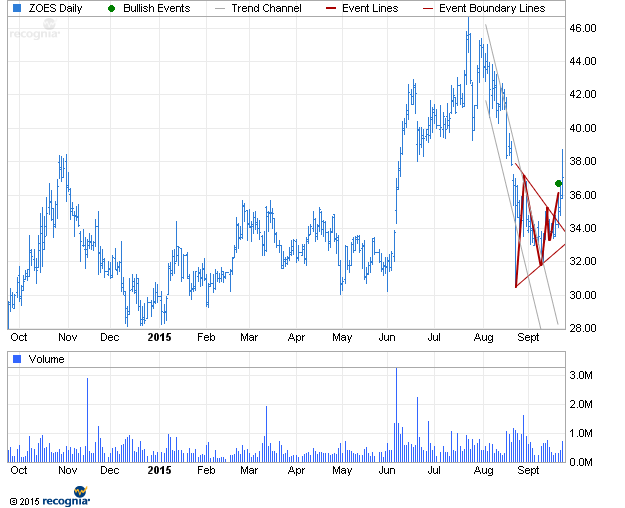 The bottom triangle takes the form of two converging trendlines, as the stock makes lower highs and higher lows. When this consolidation period is broken, it suggests that the stock has bottomed and the downtrend may be at an end. The Profit Scanner is looking for ZOES to reach $40.50 to $41.75 in the next 15 to 20 trading days. In other words, it expects 9% to 13% upside from here. ZOES is looking bullish in the near term, too. On Tuesday, the stock’s four-day moving average crossed above the nine-day MA, which in turn crossed above the 18-day MA, so this could be a great play for bullish traders. Last but not least, is the “adult Chuck E. Cheese” Dave & Buster’s (PLAY). PLAY’s Moving Average Convergence Divergence turned intermediate-term bullish last Friday; then on Tuesday the stock made an inverted hammer. As the name suggests, this pattern is the opposite of the hammer. It consists of a long upper shadow (an attempt at higher prices) and a small real body at the lower end of the range. The balance of buyers and sellers appears to be evening out, which means the price may have bottomed and looks ready to turn higher. Also on Tuesday, PLAY’s 21-day MA crossed above its 50-day MA — another compelling bullish signal. Profit Scanner powered by Recognia can help traders of all levels uncover these signals to determine the best timing to buy. Or use Profit Scanner’s technical insight to validate your own trading ideas. See how easy this powerful tool is to help you uncover hidden opportunities in the market. Did Hillary Clinton Make Biotech Stocks a Bargain? Article printed from InvestorPlace Media, https://investorplace.com/2015/09/consumer-staples-stocks-zoes-wmt-play-tues/.